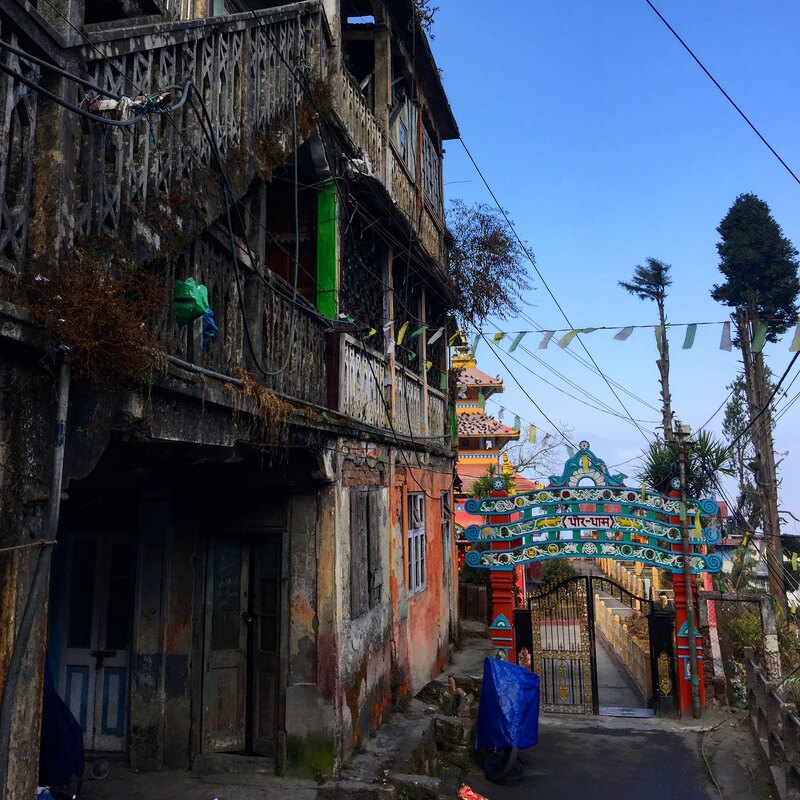 We arrived in Darjeeling via steep and windy roads with breathtaking views of the valley below. The usual Indian driving continued, the echos of ‘beep beep’ rang through the serene landscape as every scooter, car and jeep wanted to overtake our bus while negotiating the sheer 200ft drop just centimetres away on the other side. Most roads were barely wide enough for one car let alone two way traffic! 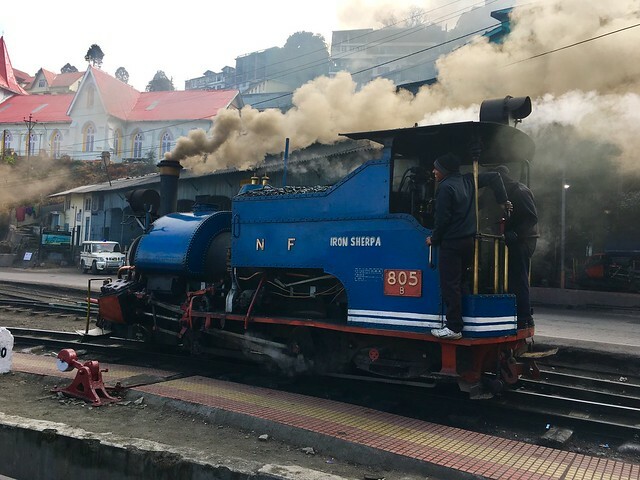 I knew we had arrived in Darjeeling as a miniature railway had appeared beside the road and crisscrossed it at various points – the road that was hardly wide enough for our bus now had to squeeze us and a train down narrow streets. We stopped for lunch at what in England would have been a builders cafe, and waited hours for our food, half of which never arrived and which gave Mike another Delhi belly. While we were waiting however we glimpsed our first look at the ‘toy train’ as it chugged around the corner. Smoke billowed from its coal fired engine as it round the corner slowly and we all took pictures. Mike dived out of the bus as we arrived at our hotel; the rest of us left our bags and took taxicabs up to a Tibetan refugee camp. The bus wouldn’t fit the narrow roads any longer. 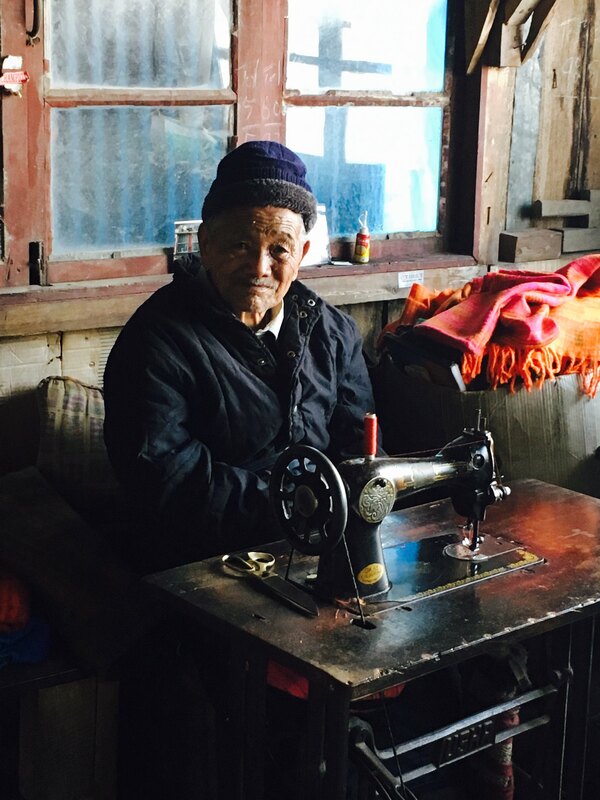 The camp was home to many families of several generations who had fled Tibet back in 1959. The older folks worked in the myriad of buildings spinning cotton, weaving carpets, sewing garments and painting landscapes. The younger generations now worked in the town but as long as one member of the family worked in the camp they could all live there. A community feel was evident and I respected their commitment to keeping their traditional ways. The following morning we got up early and departed for sunrise on Tiger Hill. We expected a grass knoll with a couple of dozens people. We were greeted with several hundred if not a thousand people, on top of the 10,000ft high hill top. The locals had begun construction of a viewing platform that like all buildings was ‘not yet finished.’ The stars shone brightly, quite breathtakingly so, and it is one of the few times in my life I’ve seen a crowded sky full of constellations. We jostled our way to the front and held our position. Peace and serenity was not what this sunrise was about; my overriding memory is that of “selfie, selfie, selfie” and “coffee, coffee, coffee,” being shouted out in thick Indian accents as selfie sticks and coffee from coal heated kettles was poured. Nevertheless we waited and waited for the sunrise. While spectacular once it came, over the horizon and on top of the clouds as we were above them at this height; it was the view to the left that was more astonishing. 4 of the 5 worlds highest peaks came into view, with the red sunlight illuminating their snow capped beauty. The nearest and 3rd highest in the world, Kangchenjunga, looked spectacular. Photos could not do the Himalayas justice and it was impossible to fit them all in one picture. After a few selfies and attempted photography we descended with the throng of crowds. After breakfast and a nap we took our taxis to Darjeeling rail station at 6812 feet, a UNESCO heritage site. The Himalayan Railway was built in 1881 as a means to connect the mountainous terrain and serve the tea plantations and the valleys below. The motor shed housed about 6 engines, 2 diesel and 4 coal. Two of which were chugging into life and being driven into position on the tracks. The noise, smell and dirt was unexpected and we were covered in soot at one point as a coal engine named ‘The Iron Sherpa’ blasted its smoke into the air and we were left covered in small particles. We had an hour before our scheduled train departed, so we looked round a nearby closed temple to Shiva the god of destruction. Various photo opportunities arose but it was the train we were waiting for – even though Mike being scared by flocks of pigeons was entertaining. Boarding the train in carriage two of two, we slotted into our extremely narrow seats and awaited departure. Speed was not the focus but more the engineering feat that was achieved well over 130 years ago. The train jerked through the narrow roads with cars whizzing by and squeezing through. Cars passing by on one side within half a metre and shop fronts and front doors on the other even closer. What was surprising was the food left on sale next to the track as the black smoke polluted the mountain air. Raw chicken, fish, vegetables and fruit all getting a coating of soot. Likewise locals clean washing hung metres from the track absorbing the smell and dirt. We rode for 8km stopping twice, once for water and the other for a photo opportunity/monument to the Gurkhas. We pulled into the next station and detrained. Taxis raced us back down the hill to the town centre where we ate lunch, a clean and pleasant place run by an Indian John Lennon wannabe, complete with long hair and round rimmed glasses. We left and walked to our transport and were taken up the mountain to a Japanese peace pagoda and temple for Buddhists. White, large and pleasing to look at but not particularly old or historic. Cold marble and stone greeted our feet as shoes weren’t allowed (out of respect) as we explored the pagoda anti-clockwise looking at Buddha in his many sitting and laying down positions. We left and raced in our taxis to a tea estate on the other side of town; tea what Darjeeling is known for is one of the main attractions. 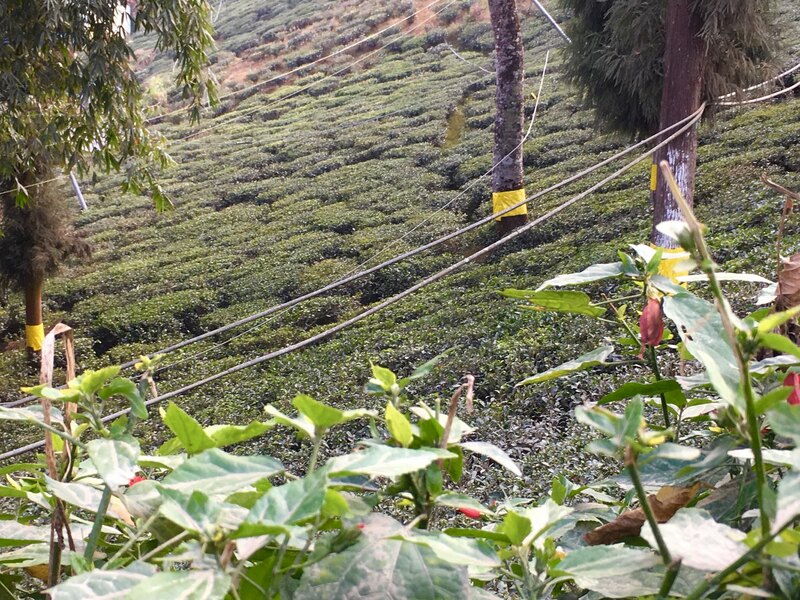 However, being a Sunday and because our train the following day had been cancelled (and we needed to get an earlier one) we had to visit the tea estate today which meant the factory would be closed. A shame but the photo of tea fields is what I was after. Tea bushes covered the hills but because it was winter no picking was going on this time of year. So no picture of people in wide brimmed hats and baskets on their backs. But stunning fields were in abundance. A local guide described the tea making process and how different types are made. When it is picked, how long it is fermented and what part all make a difference to the type of tea. For example white tea (supposedly the most expensive) is made only using the flower of the tea bush specifically the stigma. While spring and summer flushes (when the tea is picked) are lighter and more delicate than autumn flushes. Green tea is the leaves not fermented while black tea had been fermented longer, the degree to which you do gives it its strength. We wandered the estate and took pictures. A type of plant from Guatemala were also being grown, to use to make a natural pesticide to keep Darjeeling tea organic. Tea tasting would come later as we first visited yet another temple. This temple was Hindu and to Shiva again. What set it apart from others was the abundance of prayer flags. Thousands. Quite beautiful in the breeze and trees. Even a local monkey sat there enjoying the view. Our local guide explained the significance of various points and rang each bell he walked under. Letting the gods know he was there visiting, like someone ringing your door bell at home. We descended the temple, passed the best box street dancing competition and tasted tea in a local shop. We were given several different flushes and green tea. All without milk or sugar. I had given up sugar as a 2016 new years resolution in my tea but I had always had milk. Drinking it milk-less was a new experience and one I enjoyed and I’ll now stick too! The second summer flush was my favourite and if it weren’t for us travelling I’d have bought some. I’ll look out for it at Sainsbury’s back home. The sun now setting we turned our attention to dinner and our day of travel the following day to Varanasi by sleeper train. We loaded up with fruit, water and a pastry for breakfast and ate dinner at the finest restaurant in Darjeeling. We opted however not for Indian cuisine (we’ve had a lot) but fish fingers and macaroni cheese. An enjoyable change. ← Is the street food in India safe to eat?